Similar to Christmas for the Christians, celebrating the birth of Christ, Wesak for the Buddhists heralds the birth of Prince Siddhartha, who eventually attained Buddhahood as Gauthama Buddha. Wesak day is the most important day in the Buddhist calendar. All over the country, temples, in the villages, and in the cities, announce the dawn of Wesak, with peals of bells, and drum beats. The devout, clad in pure white, with no make-up or jewelry, make their way to the temple, to spend the next twenty four hours in quiet contemplation. No solid food in taken after mid-day meal, for this day, the holiest of days in the Buddhist calender, one is there to rid the mind of impure thoughts, and the body of impure habits. (Observe Sil). While the rest of the village, gather at the temple grounds after sunset to participate in lesser religious activities, like reading of holy books, or listen to the saffron clad monk relate ancient stories from Lord Buddha's previous lives. ( listen to Bana ). Simple candle-lit lanterns like these, that seem to fascinate these youngsters, made with bamboo frames and covered with colored transparent paper adorn every house, for Wesak, is a muted celebration as well. Over two-and-a-half thousand years ago in northern India, Gautama was born, attained Enlightenment, and passed away, on the day of the month, separated by some 80 years and Buddhists all over the world celebrate the three events on Wesak day. Perhaps originally Wesak was observed purely as a religious festival whereby the obervers gathered merit for the benefit of their current life or the future life. But with the growth of commerce, many large businesses in cities like Colombo saw the commercial possibilities of Wesak, similar to how the businesses in the west embraced Christmas. Sending of Wesak cards to friends and business associates has become the done thing, during the month of May. Shops selling large and small lanterns, candles, and various electric lighting sets, and papers of any imaginable color abound. Many of the bigger companies pay other small companies to make large Wesak lanterns like these in the hope of attracting prospective customers, and they do come .... Traffic in the streets leading to more popular sites, bad during normal days becomes impossible during the Wesak Holidays. This Wesak lantern, elaborate and several tiers high, could have cost the sponsor quite a large sum of money, but that would be offset with the extra sales !!!. Hinduism has been part and parcel of Sri Lankan life for many undereds of years. Over the years, popular Buddhism has absorbed a number of Hindu customs together with a galaxy of local gods. There is hardly any Sinhalese Buddhist who can deny of his or her reverence to one or two of Hindu gods or deities. The awesome of these deities is the god Skandha or Katharagama whose shrine is in the deep south. Katharagama is a terrifying figure, and he exacts a heavy price from those whose petitions He grants. Those who have been cured of grave illnesses, or whose prayers for children have been answered, must redeem their vows with an offering of pain. Sometimes they have to walk across burning coals, but the most common penitence is to be dragged around the streets swinging from a bar to which they are attached by savage iron hooks struck into the flesh of their backs. Kandy Esala (July/august) Perahera is a spectacle not to be missed by any visitor to Sri Lanka. The ceremonious and auspicious exposition of the Tooth Relic of the Buddha at the annual pageantry of the Kandy Esala Perahera is an event of national importance in the Buddhist calendar. The Diyawadana Nilame or the civilian Chief of the Temple of the Tooth is the custodian of the most sacred Tooth Relic. It is a historic belief that the Tooth Relic is symbolic of the national sovereignty. If the nation loses the ownership or the custodianship of the Tooth Relic, it signifies that the Buddhist Sinhalese majority have lost their, nationhood, sovereignty and independance. The Buddhists in Sri Lanka venerate the Tooth Relic as the pinnacle of their devotion and dedication. Any harm, threat or terror towards this relic is viewed with great anger and protest as was evidenced when there was a recent terrorist attack on the Temple of the Tooth complex. 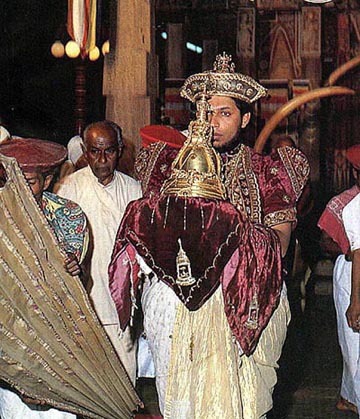 The Tooth Relic of the Buddha in its golden casket, being ceremoniously escorted by the Diyawadana Nilame, for parading in the Kandy Esala Perahera. Although Sri Lanka cannot boast of street carnivals like those in Brazil, Trinidad or England (the Notting Hill Carnival), the Kandy Perhaera is not second to any of these western extravaganza. Kandy Perhahera, besides being an event of spectacular exuberance is also an exhibition of religious devotion and national pride. There are ceremonies and rituals associated with every part of Sri Lankan's life. From birth, first solid meal, first lesson, first job, and "first" anything must be done at the right, and auspicious time, dictated by ancient and somewhat mysterious legends and lore. Some of these rituals may only involve a visit to the village temple, or a small offering to the Gods, but the major ceremonies, specially that are religious in nature are, are celebrated to the full. The Esala Perahara in Kandy is the biggest of these events. Although Sri Lanka celebrates January 1st as a New Year from a western or international perspective the proper Sinhalese and Tamil New Year (avurudu), is celebrated about the 13th - 14th of April. This is a very special time in Sri Lanka. The larders are full since the harvest has just been collected, the trees are full of flowers, the homes are freshly painted and it is time for festivities. The precise times when the old year ends, and the new year begins, (most times the two does not coincide) are calculated by astronomers, and is generally announced by the peal of temple bells. Everything during this time must be performed at precise times (nakatha), and in the prescribed way. The lighting first fire in the hearth, start of work, first transaction, first application of oil to hair, first meal, to name a few. In between these rituals, the time is spent playing games, visiting friends and relatives, enjoying the many sweets that are made for the occasion, and generally having a great time. Music and poetry has always been a part of village life in Sri Lanka, and what better time to enjoy some singing and merry making than the avurudu festival?. Poetry contests, or contests between teams of drummers between adjoining villages are common during these celebrations, These village beauties playing the "rabana", a one sided drum, somewhat like an enormous tambourine, certainly looks like a winning team. Folk culture, festivals or ceremonies are not peculiar to Sri Lanka. Folk festivals or ceremonies have thrived in different parts of Sri Lanka from historic times. A vast majority of the people of Sri Lanka are Buddhists. But throughout history, folk cults with beings of supernatural powers that influence day-to-day lives of the people have entered the main stream Buddhism. There are elaborate rituals to pacify these evil spirits and to appease the benevolent. Although not encouraged by the Buddhist clergy, there is a large following of these rituals, specially in the southern part of the country. The commonest of them is the "devil dancing", which is a form of exorcism with quite a bit of theatrics thrown in for good measure. The colorful and sometimes frightening masks worn by the performers, represent the good and evil spirits. These masks are all hand crafted by traditional craftesmen out of local soft woods and can be quite elaborate. The town of Ambalangoda in southern sri Lanka is famous for these masks. Kandy Perahara started during the reign King Megavanna , (301 - 331 A.D.) who decreed that the that the Tooth Relic of Lord Buddha should be taken out of it's gilded shrine inside Dalada Maligawa ( Temple of the Tooth), and paraded around the city so that the public could pay their respects. Today this pageant or perahara, held for two weeks in August (Esala in Buddhist calender), has grown to be one of the most splendid sights in Sri Lanka and South East Asia and perhaps even the whole world. Magnificently decorated elephants, colorful Kandyan dancers with their drummers, devil dancers from the southern temples, fire eaters, whip crackers, stick walkers, and an assortment of other artistes from all walks of life, take part in the perahara. A wedding in a village in the hill country (Kandyan wedding) is an opportunity not to be missed by the visitor to the island. The chain of events, prior to a wedding is generally started by the marriage broker, with a visit to the future bride's, or groom's home. The marriage broker wields a great amount of power when a wedding is imminent. He or she, is a virtual database for all available brides and grooms in the area. Information like how many siblings in the family, whom they are married to, what their worth, age, education, and any inherited or acquired diseases are some of the information stored in his "little black book". The broker, during his first visit will take stock of his/her "clients" family and suggest several possible "matches". The family then has to decide which of the prospective bride's or groom's homes to visit for a preliminary "inspection". All stops are pulled, when it comes to entertaining, by the host family for this visit by the guests,- after all first impressions go a long way. However the guests rarely get to see the future bride or the groom during this first visit. He or she will be presented ""properly" later, during a subsequent visit. The broker will arrange several more visits over a period of several months to each other's families and during one of these visits the bride or the groom will make a brief appearance, perhaps serve a drink. In most arranged marriages, like most marriages in the villages are, one is marrying into a family, and therefore the individual bride or the groom takes a lessor role, as long as they are compatible as determined by their horoscopes. This astrological "match" will be determined by the local astrologer. During the subsequent visits the families will discuss the amount of "dowry",- a payment (in cash and/or property) by the bride's family to the grooms family, - and the future partners will get to know each other a little bit better. If everything is agreed to mutual satisfaction, a wedding day will be selected by the astrologer. The preparations for the wedding generally starts several days before, sometimes several weeks, if, for instance, the house needs to be repainted. Otherwise, men in the village will start decorating the house, and the road leading to it. Usually, a temporary archway (thorana) is erected using palm trunks by the side of the road, and decorated with fresh palm fronds, palm inflorescence, and bunches of coconut and other fruits. All the cooking is done by the women of the village. Their marathon cooking session starts several days before the wedding day - first sweets and other foods that are non-perishable, then on the night before the wedding day, all the foods for wedding feast. During this time the whole village takes on a carnival atmosphere, with firecrackers, continuous loud music, some heavy drinking by the men, and some attempts at hanky-panky by the young eligibles. The day starts with a visit to the local temple to receive Buddha's blessings. Afterwards, the groom is dressed in traditional clothing similar to that were worn by the Kandyan chieftains, complete with the ornamental dagger. The bride is adorned in all her finery with gold embroidered sari and heavy gold jewelry. Then at the prescribed auspicious time the wedding vows are taken, inside a poruwa, a temporary stand decorated with flowers, and palm fronds. The customs are somewhat similar to the western customs. Wedding rings are exchanged by the bride and groom, and gifts are offered to the elders of the family, and photographs are taken for posterity. The local registrar of marriages, who is always an invited guest, will do the necessary paperwork. Until the poruwa ceremony the bride and groom who were kept separated, now get to sit together and enjoy the wedding feast. Soon after the wedding feast it is time for the bride to accompany her new husband to his home and another round of rituals and celebrations. We in Sri Lanka can, and most certainly do, turn any opportunity into a celebration. The first day in school, first day at a new job, "first" of any thing call for some form of reveling. A child's first solid meal, therefore, is a time for rejoicing. For that day, for the children, many varieties of sweets, a big pot of "kiri bath," (rice cooked in coconut milk), and for the adults, a veritable feast of rices, vegetables, meats and fish are prepared. Prior to the auspicious time, the sweets, milk rice, a sheaf of betel leaves, some coins, gold and silver, books, a ceremonial oil lamp, and many other items used daily by grown-ups are spread around on a woven mat, with room for the guest of honor in the center. At the "proper" time the child is placed in the center of this "slice of life" and carefully watched for what attracts him most, for according to tradition this dictates what he is to become later in life. If the coins are touched first, a life as a trader, or a banker is in store, the leaves, a farmer, perhaps, and the book, definitely a scholar. This child certainly seems bent on being a scholar, or is it that a lesson from a loving "loku attha," (great grand father) too much to pass over?.